Have you heard about math workplaces at home? Math workplaces are a chance to do some personal practice on different areas of our math curriculum. Generally, there are six workplaces available during each session. The workplaces available rotate with the curriculum. In addition to the workplaces the students also go to "personal practice" where they meet with the teacher for some small group work and iPad math time. The students have a workplace log where they keep track of where they have and have not been. This way, we make sure that we are visiting all of the workplaces available and not just the same ones. It has been a great way to extend our learning! Ethan and I are sitting here checking out the blog. He is so happy that Ian from 2nd grade helped him during the activity. HOORAY! 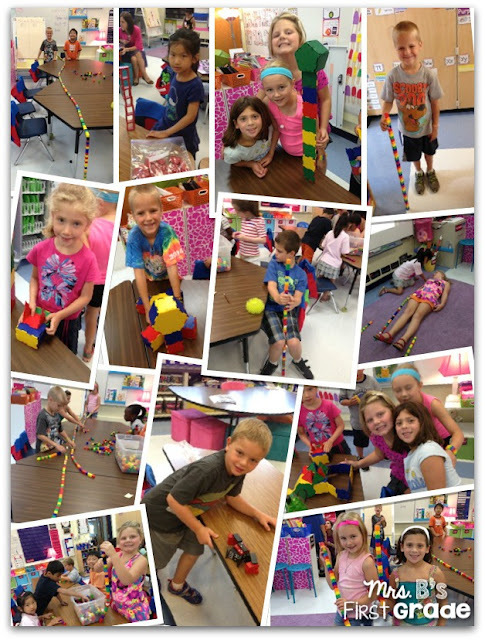 I am finally able to get on your BLOG 1st Graders and see all these fantastic photos! You sure do make MATH look like fun!